The last time I heard composer Andrew Poppy, aside from his string arrangements on Psychic TV's recently reissued Dreams Less Sweet, was on Dark Matter, a compilation from the now defunct Glasgow based label Source Research where he appeared alongside Coil, Cyclobe and others. To many Andrew Poppy is forever linked to ZTT Records where he was in-house composer but that, however, doesn't take account of his arrangement work for the likes of Coil, Nitzer Ebb, Strawberry Switchblade. In recent years he's worked with Claudia Brücken on an album of piano based covers produced by Paul Humphreys of OMD, and had a release of piano sonatas released on Touch's cassette imprint, The Tapeworm. 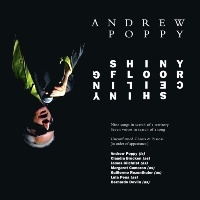 On Shiny Floor Shiny Ceiling Andrew Poppy is reunited with a number of artists he has worked with previously - including Claudia Brücken and Paul Humphreys - along with some fresh faces who lend their voices to Poppy's compositions. The release of Shiny Floor Shiny Ceiling was preceded by a series of shows at the Chelsea Theatre, London billed as "opera entertainment for voices, performer and dancer". Along with 'If I Could Copy You', Shiny Floor Shiny Ceiling is bookended with tracks featuring the spoken voice of Andrew Poppy. While most of Shiny Floor Shiny Ceiling is song based, Andrew Poppy's own vocal contributions are much more text based and whimsical; his erudite, mischievous wordplay both confusing and perplexing. The opener 'Twelve Thoughts On The Language Of Others' is driven by bass tones and the tick of programmed drum rhythms with rubbery beats, interrupted by the kind of computer generated sounds that signal the arrival of email. Here, as on his other vocal based tracks, Andrew Poppy imparts stream of consciousness lyrics, this time, about great songs, song construction of and the inherent memory a song leaves behind. The smooth, crystalline voice of Claudia Brücken (of Propaganda) features on the melancholic electro ballad 'Dark Spell', awash with Poppy's string arrangements. It's one of the albums most accessible moments in an album that encompasses electro-pop, opera, Classical Lieder and contemporary Fado. The title track is sung by the classical tenor James Gilchrist over classical piano score; its rapid chords recalling Ernesto Tomasini's work with Othon (who incidentally studied under Andrew Poppy) but here the score is cut with electronic rhythms and quivering electronic thuds. Shiny Floor Shiny Ceiling moves further into operatic realms with the classical mezzo soprano voice of Margaret Cameron who sings unaccompanied on 'Persephone Calls'. Cameron also sings on 'Persephone Scream Dream', alongside the spoken voice of Andrew Poppy. The entire track captures the nature of the disorienting lyric, with electronic rhythms and huge buzzing swathes of sound, punctuated by organ stabs and piano score. Shiny Floor Shiny Ceiling features numerous guest vocalists and Andrew Poppy matches the vocalists to the songs particularly well. 'Dance With Me' plays like a mor interwar ballad with the voice of Argentinean singer Guillermo Rozenthuler, backed by the operatic soar of Margaret Cameron, over a piano score furnished with strings and buzzing electronic touches. Fado singer Lula Pena lends her earthy tones to 'Unravelling' which is suitably sombre and gloomy, while the classical tenor James Gilchrist takes the lead for 'Singing Into The Air (Aufgesetzt Auf Dem Bergen Des Herzens)' setting the Rainer Maria Rilke poem to an impressive orchestral arrangement. Things take a surprising turn on 'Knacker's Yard Blues' evoking a dustbowl atmosphere, with its spare bluesy arrangement heightened by the drawl of the Portuguese singer Bernardo Devlin, as it moves into Bad Seeds territory - and that's without mentioning the "bad bunny" references touched upon in the lyrics. Effective in its simplicity, it manages to pack an emotional punch far, far removed from anything else on Shiny Floor Shiny Ceiling. And then there's the other Andrew Poppy tracks. The rhythmic tick of 'If I Could Copy You' is swollen with strings and electronic touches, while Poppy on the final track, 'Do The Flip', features a playful cut'n'paste lyric drawing upon modern culture, into a monologue about transformation over a piano score and skittering electronic rhythms. Death In June - NADA!